This is what it looked like last September, the Grevillea is the mass of dull green to the right of the variegated Comfrey, to the left of the potted Agave ovatifolia. There's supposed to be a pathway there, to get around to the back of the stock-tank pond. Once the Grevillea started leaning I just had to push my way through. Here's what it looks like now. You can see the Comfrey has exploded, and is trying its best to block the path, but as soon as it's done blooming it will get cut back and become a spectacular mound of big leaves, not nearly as tall and leaning. So what did I plant in the Grevillea void? Not as much as you might think. Or maybe I should say, not much that can't be easily moved. I kept remembering Alison and Evan's comments on the post when I mentioned removing the Grevillea and pondered what could go in it's place. Alison: "Well, I was kind of with you right up until you said, what should I put in its place? Won't that defeat the purpose of pulling it out? You know I hate throwing away plants, but that Nolina is definitely going to appreciate having more room, not to mention all the other plants that will like having their moment to shine. I guess it's kind of like exercise, or pulling a tooth, or a bandaid -- just do it. But leave the space empty for a while." Evan: "Before you put anything else in the resulting empty space, I think you should take a walk through the McMenamins Kennedy School garden to give yourself a reality check on how big that Nolina will get. It will likely pick up speed with the grevillea removed. If you absolutely can't stand the empty space waiting for the Nolina and other plants to fill it, I would go with the metal trellis idea. It will fill the space and a vine growing up that will hopefully be easier to remove than a shrub when the time comes to make room for the Nolina and other plants." It's a wonder I like both of them as much as I do, their being spoilsports and all. I kept picturing an Agave here, but one up on a stage, of sorts. Then I found this cool metal vent thing at the Rebuilding Center. Yep, had to have it. 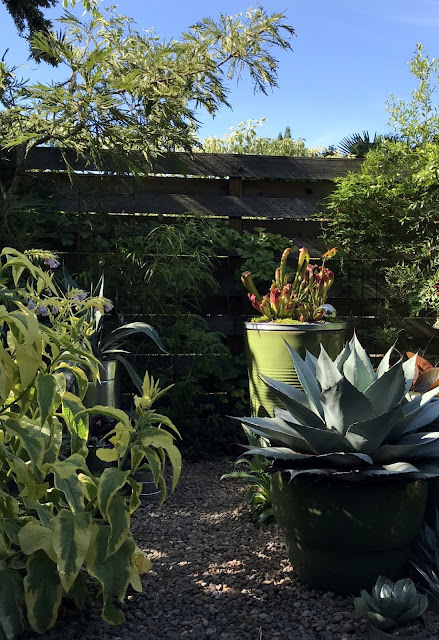 Containers can be moved, so I planted up this one with the Yucca faxoniana I bought at Cistus earlier this spring. And then I sunk in a small trellis. I have two others nearby, one with an expanding Akebia longeracemosa 'Victor's Secret' all over it (and finally working its way along the fence). And another with a Lardizabala biternata attempting to grow. Poor thing is getting a little shaded out. And now there's a Passiflora 'Amethyst Jewel' growing on it. I've tried to get so damn many passionflowers established in my garden, almost all of which have died, this will be the one that finally grabs hold and takes off. Why? Because the trellis is pathetically undersized. Now's the moment in this post where we pause to admire a few nearby plant combinations. Persicaria microcephala ‘Red Dragon’ and Podocarpus matudae are a match made in heaven. I'm excited that removing the Grevillea allows these two plants to get a little more attention. Those curly filaments on the Yucca make everything look good, I love them with the Agave spikes (oh! that's skipping head...we'll get to the Agave in just a moment). The silver-green of Ficus afghanistanica 'Silver Lyre' looks quite fetching next to the Comfrey (Symphytum × uplandicum 'Axminster Gold'). Which I am itching to hack back. Soon! The bees love the flowers, but as I said — I prefer the tidy mounds of big leaves that will come next. Back to the project at hand. 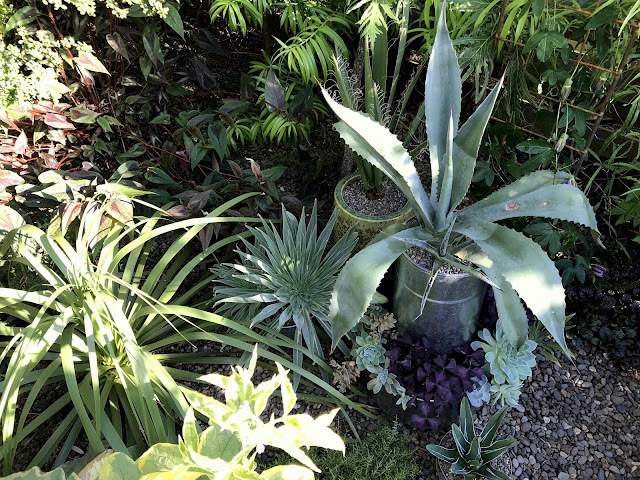 I used an Agave I already had to plant in the tube (a long suffering pup my brother sent years ago, from a plant in his Phoenix garden), and filled the bottom sections with random succulents I picked up at Little Prince of Oregon back in March. I also added a trio of purple Oxalis, because I fell in love with them in Austin. Besides the Passiflora the only other plant in the ground here is... (wait for it)...another Grevillea australis (ha! ), however this one is G. australis var. prostrata, a prostrate form that will stay low and moundy. Tucked in behind the Grevillea is a double headed Echium Wildpretti that's actually in a container. I've planted so many of these (all seedlings dug from a friend's garden) in both the front and back gardens this year. I decided to containerize this pair as insurance, just in case it's a bad winter, that way I've got them ready to go next year. Jumping across the pathway now, to the stock-tank pond side...in the first "after" photo, at the beginning of this post, you may have caught a glimpse of a few brightly colored plants atop the tall green container. After years of a variegated Agave americana calling this spot home, I decided it was time for a change. A shallow metal dish (which some of you might call a trash can lid) was planted up with a collection of Sarracenia. I did line the lid with plastic first, just in case the galvanized metal was not agreeable to these (rumored to be sensitive) plants. The view from behind the pond. The Sarracenia glowing in the evening sunlight. For now the newly planted up area is pretty obscured by that monster Comfrey. I kind of like the mystery. And the relatively open pathway. I'll share another photo or two as things change in the coming weeks. Hah! By planting in containers that you can move you have the best of both worlds. You got to plant some new things, or move things to better locations, and keep the path clear as well. It will be nice when you can cut back that comfrey. The Agave ovatifolia looks very pokey, and I wouldn't want to be the one having to squeeze between them. I love the way you planted up that vent. I do love to rain on parades. The containers are a great solution. If the time comes that they need to move, no digging required! I like the mystery of the vignette blocked by the comfrey. When you cut it back, you'll get a whole new view. Oh, Podocarpus matudae, why must you be so fabulous? I planted a small one the spring or summer of 2016 and lost it that winter. Bad timing. Since conifers are immune to verticillium, I've been looking for a spot to try again. Try it again! I love that plant (tree). This may be a repeat comment (new browser problems). Excellent decision making with fabulous results. I can't understand how 'Silver Lyre' hated life in LA -- wouldn't grow an inch. But then I'm having the same problems as you with big stuff like shrubs overgrowing access paths, so it's probably best. I love the new roomy look! I got three comments Denise, so something was working. I'm so sorry your 'Silver Lyre' wasn't happy, I know how much you loved that plant. It all looks gorgeous, but I especially love that newly planted vent thing! You always come up with great solutions but it never hurts to give those decisions some time and thought (not that that's one of my strengths). You also have a great ability to envision unexpected uses for odd objects - like some kind of garden archaeologist. Garden archaeologist, hehe, I like that. Your garden is looking impeccable and just love the finished look, and how everything layers so nicely. Impeccable!? You're too kind, you should see the rest of it! Another triumph! I love everything about what you've done. Loree, I don't think there's a thing you could have done wrong here even if you tried. The space is so wonderful, and every change makes it better -- or at least fresh to your eyes, which is just as good as "better". Ah, good point about fresh being better, that's so true! And thank you for the kind words. Your garden always looks so trim and neat, with everything looking healthy and beautiful. I need to take those quotes to heart as I have some paths that are rapidly disappearing. I had a lot of catching up to do in May, but it is coming together, thank you. Well I have to say your trash can lid device is excellent. And I am a strong supporter of showing overgrown plants the door to the compost bin. I've dug up my share in the last year ! I like how it opens up the space and allows one to really see the plants that are there as individuals. A friend dug this one out but sadly it didn't make it. He took a bunch of cuttings though and I think some of them live on. Every picture in this post is a gem. Persicaria ‘Red Dragon’ and Podocarps look so good together. I'm too fell in love with the purple Oxalis from your Austin post but I wouldn't know how to used it exactly. Your placement of it in the shiny container makes for a fabulous contrast. Thank you! Of course the Oaxlis will need to be pulled from the planter if I want it to winter over, ditto for the succulents. The Saracenias are impressive! And I love, love, love the succulents with the Oxalis! I would never think to do that, but it's awesome. Oh, and the curlies on the Yucca with the Agave spikes! I think Alison and Evan were right, because it looks perfect now AND you can play around with it. I'm sure anything you would have done would have been fabulous, but this gives you loads of flexibility. Thanks Beth, loads of flexibility is a good thing.